Travel Interstate 494 north which will turn into Interstate 94 west. Travel to exit #178, the Clearwater exit. Turn right, travel about 4 miles to Hwy 10 and turn left onto Hwy 10. Stay on Hwy 10 until Little Falls, about 45 miles. At Little Falls take Hwy 371 North to Brainerd. Stay on Hwy 371 through Brainerd/Baxter. There is a city bypass on Hwy 371 that will keep you from driving through the city. Continue on Hwy 371 for about 60 miles which will bring you to Hwy 200. This is at a stop light and a “T” in the road. There will also be Northern Lights Casino at the stop light. Turn east or right onto Hwy 200. Travel about one mile to Onigum Road (County Road 13), turn left, travel 6.7 miles to County Road 72, also called Pine Point Road and turn right. Travel 2.3 miles (just past Brindley’s Harbor Resort), turn right where you see our green county sign onto Pine Point Drive. Follow the sign at the ‘V’ in the road to the left. Travel less than 1/4 more mile and you will see the our big sign and the entrance to the resort. Follow the road on the left to the top of the hill and you will see our office. Travel Interstate 94 east to exit #6 in Minnesota. Exit #6 is Hwy 11, turn left or north onto Hwy 11, travel about 4 miles to Hwy 10. Turn right or east onto Hwy 10. 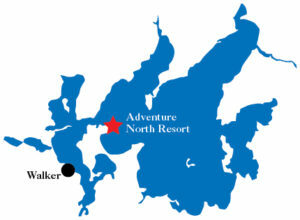 Travel about 45 miles to Detroit Lakes. At the first stop light you come to turn left and travel about one block to Hwy 34. Turn right or east onto Hwy 34. 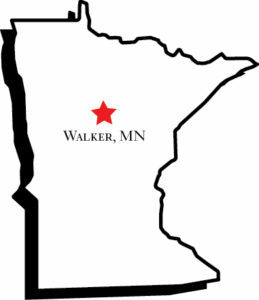 Travel on Hwy 34 to Walker MN, turn right onto Hwy 200 at the stop light by Super One Grocery Store. Travel through town, about 5 miles staying on Hwy 200 until you come to Onigum Road (county road 13). This turn is 1 mile east of Northern Lights Casino. Turn left on to Onigum Road, travel 6.7 miles to County Road 72, also called Pine Point Road and turn right. Travel 2.3 miles (just past Brindley’s Harbor Resort), turn right where you see our green county sign onto Pine Point Drive. Travel less than 1/4 mile and follow our sign to the left at the ‘V’ in the road to the left. Travel west on Hwy 2, approximately 9 miles past Floodwood turn left or west onto Hwy 200. Continue on Hwy 200 through Hill City, Remer and Whipholt, approximately 65 miles. Turn right or north onto Onigum Road, travel 6.7 miles to county road 72, also called Pine Point Road and turn right. Travel 2.3 miles (just past Brindley’s Harbor Resort), turn right where you see our green county sign onto Pine Point Drive. Follow the sign at the ‘V’ in the road to the left.